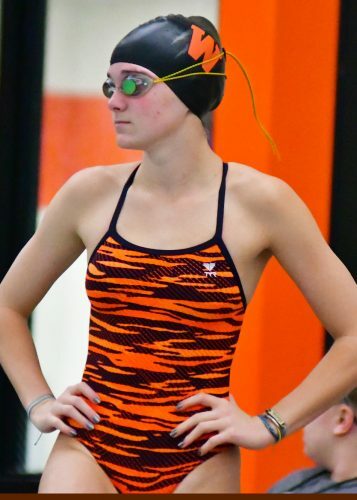 INDIANAPOLIS – The worried look on Delaney Wihebrink’s face immediately after looking up at the clock Saturday at the Warsaw Girls Swim Sectional told the tale. That worried look immediately changed to one of jubilation, knowing she had broken her own school record in the breaststroke, but the curiosity of a state berth was still unknown. 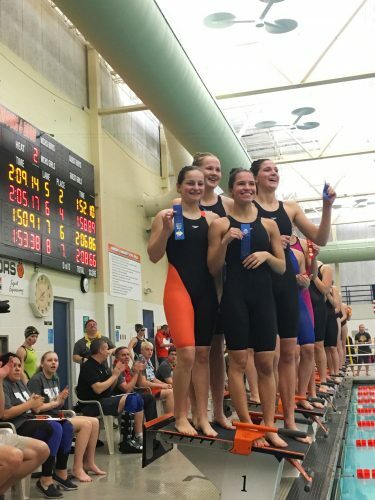 Wihebrink found out earlier this week that despite finishing runner-up to Abigail McCarter of Rochester in the breaststroke finals, her time of 1:06.19, was good enough for one of the eight at-large spots and a return trip to the IHSAA State Finals. Wihebrink will also swim with the medley and 200 free relays teams from Warsaw, both claimed titles to earn automatic bids for Indianapolis. Warsaw’s Delaney Wihebrink is seeded 26th in the breaststroke finals. Both of the relays, like Wihebrink’s breaststroke, were school standards from what was a wild sectional for school records. The medley relay posted a 1:50.91 comprised of Wihebrink, Lauren Kuhl, Taylor Gunter and Olivia Herman, and the 200 free a 1:40.34, made up of Wihebrink, Gunter, Herman and Laurel Moeller. The medley is seeded 27th and will swim in heat one, the 200 is seeded 23rd and will swim in heat three. The top seeds coming into the state from the Warsaw Sectional are both 14th places, those being Autumn Baumgartner of Culver Academy in the 100 free and Maddie Sailors of Rochester in the 50 free. Manchester’s Halle Briner will make a pair of appearances in the 200 and 500 freestyles, 28th in both events. Northridge has a great chance to challenge for a top-five spot in the team standings, and compete for event championships in the process. The Warsaw medley relay on the podium after it’s record-setting performance last weekend. From left to right are Lauren Kuhl, Olivia Herman, Taylor Gunter and Delaney Wihebrink. The Raiders have the No. 1 overall seed in the 200 free relay at 1:34.43 and are second in the 400 free relay at 3:27.25, just a tad behind Carmel. A good part of the relay success is the work of freshman sensation Elsa Fretz, who is seeded second in the 100 free and fifth in the 200 free. Sydnee Emerson also comes into the finals with two top-ten seeds, fifth in the individual medley and 10th in the butterfly. In all, Northridge has 12 swims Friday night in the prelims, plus two of the top three divers coming into the weekend after Sara Troyer obliterated the field at Mishawaka with 531.1 points, the only individual from the four regional sites to post a score over 500 points. Mary Grossman of Northridge was second to Troyer, but had the third-best score from the diving regionals. Concord sends down all three relays and has Maddisen Lantz and McKayla Miller active in two events each, Lantz in the 100 free and backstroke and Miller in the 50 and 100 freestyles. Diver Jena Lechlitner is also competing Saturday morning. Carmel, which has 18 swimmers seeded in the top seven along with all three of its relays in the top five, is seeking its 32nd straight team title, already holding the national record after its 31st last year. Hamilton Southeastern, Evansville Reitz, Fishers, Zionsville and Yorktown all have swimmers and relays with top seeds heading into Friday night. 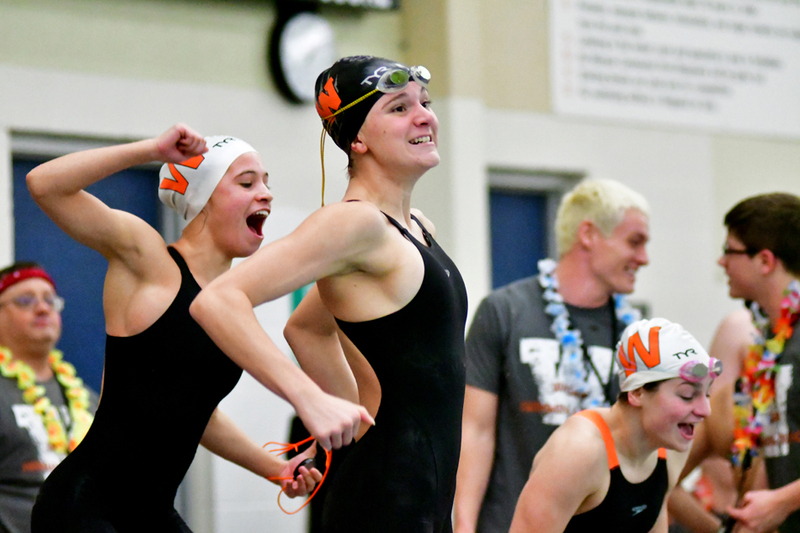 The IHSAA Girls Swim State begins Friday night with swim preliminaries starting at 6 p.m. at IUPUI. Diving will begin at 9 a.m. with preliminaries, and wrap up with the finals as part of the swim finals, set to begin at 1 p.m.